PDW's Loading Dock will appeal to anyone who's looking to add stylish luggage space to the back of their bike. It's certainly a good looking rack, and it's easy to fit too. The main body of the rack is alloy tubing, with a black finish. There's one stay swooping down in a curve from the back of the rack to the dropout mount, with another arcing off to the front of the platform. There's a small looped section of tubing at the bottom for attaching the bottom hook of a pannier. 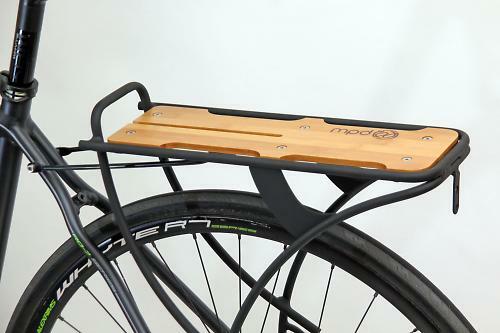 The rack platform is constructed from varnished bamboo, with cutaway sections to allow you to slide your pannier hooks in. 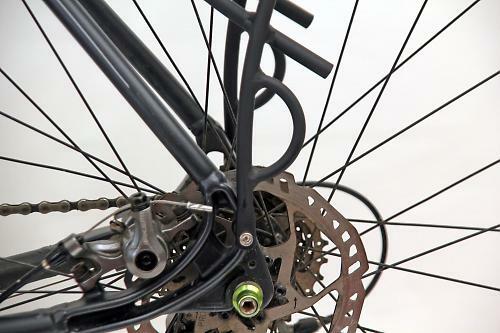 It attaches to the seatstays via an arm that's adjustable for length and angle, so you should be able to get the rack level although we did struggle on one bike with a short rear end. If you don't have seatstay mounts, P-clips are included. In use the Loading Dock is a very decent rack. 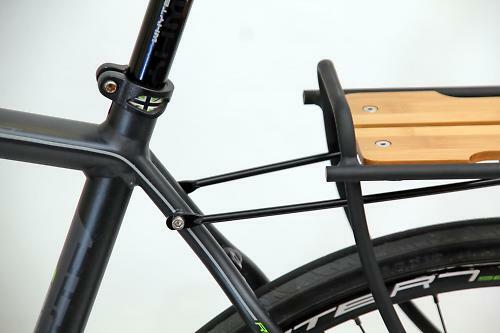 It's rated to 35lbs (16kg) so it's not designed for heavy touring or anything like that, but that's not what you'd use it for: it's an attractive rack for a city bike. I've used it with a number of panniers and they're generally been fine, although the deck can make using some panniers a bit trickier as there's not a lot of room to get your fingers in to click the closures shut. The deck is wide enough to carry a small box on if you're packing a bungee cord or two. All in all it's a good rack. It's not quite as functional as something utilitarian from the likes of Blackburn or Tortec, but if you want a good-looking rack for occasional carrying duties it's one to consider. The Loading Dock™ is the lighter weight sibling of our venerable Payload™ rack. Its oversized aluminum tubing sweeps in graceful lines to form an elegant profile and a double ply bamboo deck finishes the classic look. The Loading Dock™ is also easy to install so you will be pedaling cargo in no time. Good looks, easy to fit. Not quite as versatile as a bog-standard rack. Would you consider buying the product? Maybe, for the right kind of bike. Would you recommend the product to a friend? Maybe, for the right kind of bike. Nice idea, but it will look like crap anyway after a month of actual use.